In today’s mobile, always on business environment, information is moving further away from the corporate boundaries to the endpoints. Cyber criminals have more opportunities than ever to gain unauthorized access to valuable data. Endpoints now store the crown jewels; including financial records, medical records, trade secrets, customer lists, classified information, etc. Such valuable data fuels the on-demand business environment, but also creates a dilemma for security professionals to determine the best way to protect it. 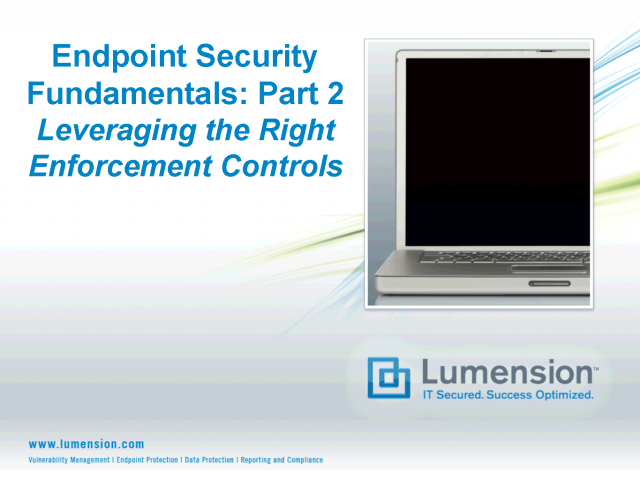 This three part webcast series on Endpoint Security Fundamentals examines how to build a real-world, defense-in-depth security program – one that is sustainable and one the does not impede business productivity.